As many of you are aware, the card blogosphere has been abuzz from Jerry Reuss' interaction on Night Owl's post about one of his childhood heroes, Jerry Reuss! To me, it was extremely exciting to see a great former big league pitcher actually acknowledge that someone, anyone, besides us reads what we are doing. I immediately felt like a 12 year old boy again, saving my lawn mowing money to buy some 1989 Topps wax packs at the local pharmacy. It brought back a lot of good memories, so thank you Night Owl and Mr. Reuss. Those who have followed this blog know that I like to make Topps cards of players that for some inexplicable reason were never made. 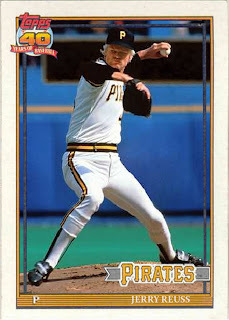 After yesterday's activity, I thought it would be a nice homage to feature Mr. Reuss on a 1991 Topps card in a Pirates uniform. His actual last Topps card is a 1990 Brewers, but to me it didn't feel right letting him go out into the cardboard sunset in a Brewers uni. It has to be a Pirate! Mr. Reuss was nice enough to post his website and his flickr photostream for us to enjoy. Using one of his flickr pictures, which is from his last major league appearance, I created the following. This card may not be reproduced for sale, and shall only be used for online enjoyment. Thank you for all the excitement you've created, and your great career, Mr. Reuss. Great stuff. That photo is perfect with '91 Topps. Wow! It's already a favorite! looks good. those 1991 cards are hard to manipulate!